Sequential Paste allows you to paste a bunch of clippings in the order you define one after another using the same keyboard shortcut. This allows you to paste a group of clippings without having to access the quick paste menu each time you paste. There are two ways to build a sequential paste queue. The first way is via the sequential paste window. Open this window by using the control-command-c (editable in the preferences) keyboard shortcut. When this window is open, anything you copy gets added to the paste queue (up to 25 items). When you are done creating the queue, you can close the window or leave it open to see what will get pasted next. 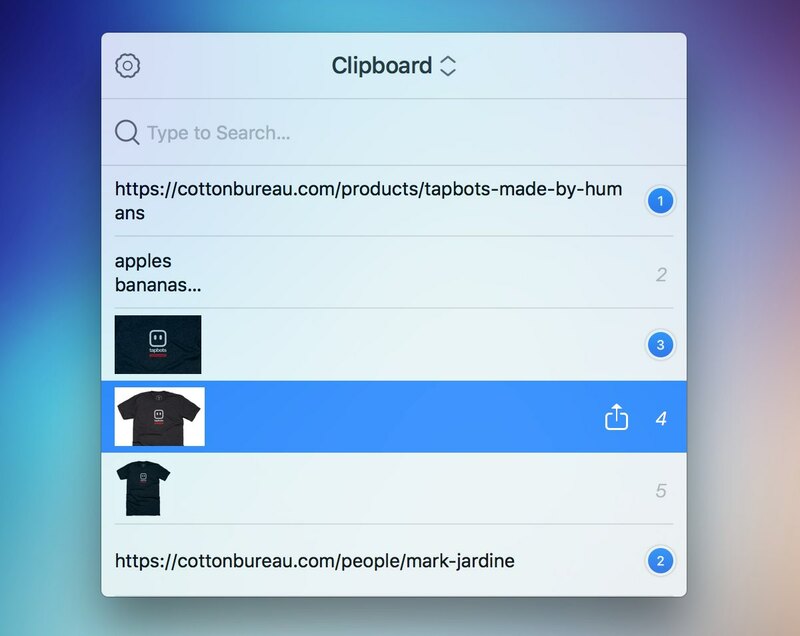 To paste from the queue, use the control-command-v (also editable in the preferences) shortcut and the first item in the queue will be pasted first. Each time you use this shortcut, the next item in the queue will get pasted until the queue is empty. This method is useful when you are about to copy multiple items that you want to paste in sequence right after. The second way to create a sequential paste queue is by pressing the right-arrow on your keyboard on a clipping. This can be done in the main app or from the quick paste window. The order you add them to the queue is the order they will be pasted when you use the sequential paste shortcut, control-command-v. You can remove clippings from the queue by pressing the left-arrow on a clipping in the queue. This method is useful when you want to build a queue from clippings already in your history.